Shropshire Modellers Deliver once again! Once again another great day was had 7th April at one of the modelling show circuit highlights presented by the Shropshire Modellers at RAF Cosford. As always the venue never fails to please with the stands set amongst the many aircraft an exhibits with ASVC this year being set under the JU52 Junkers, in addition to the Flying Flea that many folk nearly smacked their head off its propeller if it was not for J T's scarf, thanks John! The show was well attended by ASVC members, too many to mention so thanks to all that attended and contributed the the excellent club stand. Its also promising to report that the new September show posters where popular with only a few left out of a total of 100, so hopefully this is because people are interested in attending our annual show. The day was also great day for catching up with many a familiar face and also make new acquaintances in addition to possibly a few new members local to Wombourne who did not know we existed, so fingers crossed folks that we see some newbies in May! Anyhow less of the chatter and enjoy the few pictures we have from the show so far....more will follow in the coming weeks! 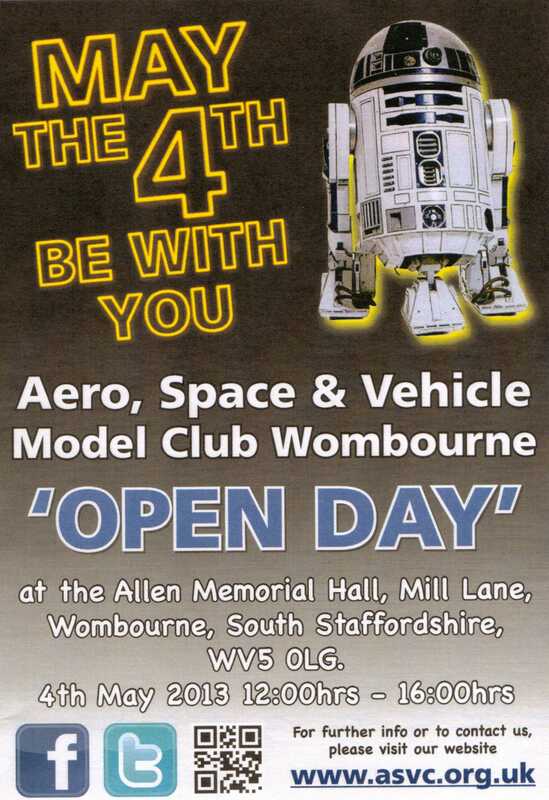 So until we meet again at the May Open Day happy modelling!